and Utah in September 2000. Click on the image for a close-up. Look for the climbers. The trip began in Grand Junction where my brother Dave was married to his bride Lisa. The wedding took place in Lisa's aunt's backyard, not far from where this photo was taken. Pictured is Independence Monument, one of the most striking panoramas in Colorado National Monument. 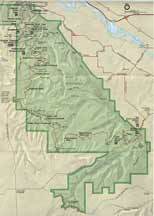 Click on the map below to see a full size version of the map published by the National Park Service.